Fee: Application Form can be obtained/submitted in person on payment of Rs. 500/- by demand draft from candidates belonging to General & OBC category or can be obtained by post by sending a demand draft for Rs. 520/- (Rs. 500/- plus Rs. 20/- postal charges for General & OBC category). 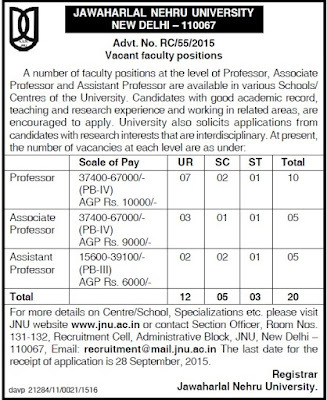 Payable on any nationalized bank in favour of the Finance Officer, Jawaharlal Nehru University payable at New Delhi (non-refundable) to The Section Officer, Recruitment Cell, Room No. 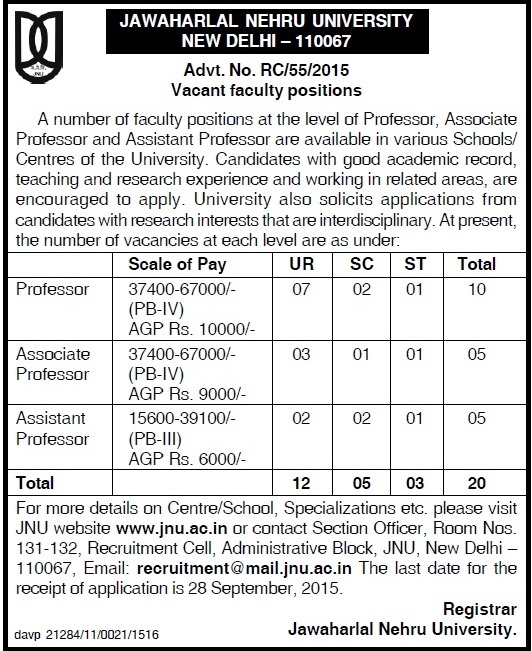 131-132, Administrative Block, Jawaharlal Nehru University, New Delhi – 110067. The application form can also be downloaded from JNU website: www.jnu.ac.in and the duly filled-in application form can be submitted alongwith the demand draft of Rs. 500/- in case of General and OBC category to the University at the above address. How to Apply: Application form duly filled, in all respect by the candidate must be supported by self-attested copies of all certificates, Mark Sheets, evidence of teaching, research experience and M.A./M.Phil/Ph.D./NET certificates, copies of reprints of published articles, certificate containing the record of date of birth, etc. DOCUMENTS ENCLOSED WITH THE APPLICATION MAY BE LISTED AND SECURELY TAGGED IN CHRONOLOGICAL ORDER TO AVOID LOSS IN HANDLING. The applications should reach the University at the address given below within one month from the date of publication of this advertisement in the Employment News. The advertisement shall be published in the 29 August, 2015 issue of the Employment News. The last date for receipt of applications is 28 September, 2015.